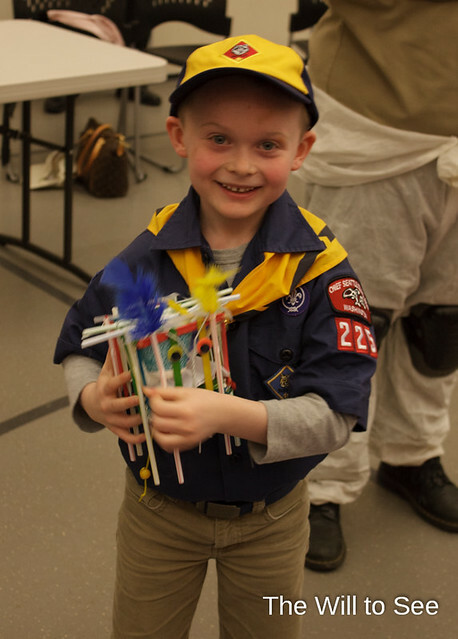 Jack’s Cub Scout Pack had an egg drop this week at the month pack meeting. Each boy was given a kit of supplies and tasked with constructing a contraption that will keep an egg safe when dropped from 10 feet. Jim, Jack and I thoughtfully put his together. Jack named it Googly Eyes. At the pack meeting he was given the egg and we got it situated. I will admit that I thought there was no way it would work. But it did survive. It was a fun evening and all the boys did really well. Awesome! Glad to hear of a successful egg drop! I’m sure it was a scramble to get everything to work.